Last week, I mentioned receiving several new books relating to the topics of Ecclesiastical Sewing and Ecclesiastical Embroidery, or Church Embroidery. In case you missed the article, you can check it out the post New Books, New Information. I was sharing information about a book entitled Design for Church Embroidery by R.A. Alethea Wiel. 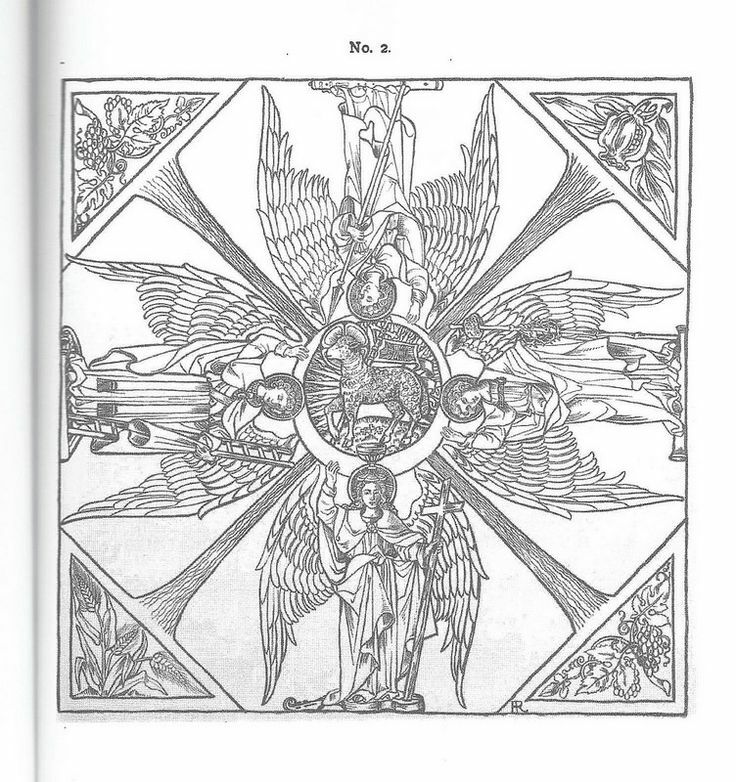 The book, available online through Google Books, is a resource book of embroidery pattern designs for various vestment and altar furnishings such as chalice veils, pulpit falls, and altar frontals. While flipping through the pages and reading the descriptions, a certain design caught my eye for some reason. the four angels stand around, guarding at each quarter the sacred element. What is now striking about this piece is recognizing the brilliance of the designer. The symmetry is perfect. The piece is well-balanced. There is movement. There are wonderful features that catch our eye and draw our vision in to focus, first on one part, then the movement takes us on to another. There is a variety of sizes and shapes used in the piece: the circle for the Angus Dei, the triangles at the bottom corners, the trapezoid shapes surrounding the angels. There are unifying elements, such as the streams of water on each corner. Every design element is perfectly positioned to be viewed and enjoyed. To design a piece such as this, the artist must have had a thorough understanding of the subject they desired to convey in pictures, an understanding and knowledge of geometry, as well as proportion and scale to have the bodies of the angels fit the space properly. The list could go on and on for quite some time before one would exhaust the topic. This design is truly a thing of beauty. It would be special to watch a chalice veil such as this be replaced following the completion of Holy Communion. This piece was designed specifically to be viewed in this way, draped over the chalice. With the simplicity of our modern designs, one can only wonder, have we perhaps lost works of true beauty as a result of the loss of excellent and thoughtful design? When one thinks of how lovely this must have been when stitched and viewed with the angels standing guard around the chalice, it is almost beyond contemplation. So, what can we as workers for the church today take away from this piece? Perhaps there is some element from this embroidery plate that can be pulled into our modern work to bring back exquisite design …………..that might be worth thinking about! While we may never know exactly what this Ecclesiastical Design looked like when stitched, I discovered a fun little way to step back in time and take a sneak peek. For those of you who own a copy of the book put out by the Royal School of Needlework, Essential Stitch Guides: Goldwork by Helen McCook, take a close look at page 80 of this book. Pictured there is an unfinished early Twentieth-century Or Nue training piece from the RNS depicting these very same angels. The piece was left unfinished for training purposes. It is striking, and one can only imagine how much more so if seen in person. The very same design can also be seen in theRoyal School of Needlework Embroidery Techniques by Sally Saunderson page 111. In searching across the web, the Tatasha Gallery Russia has a photo posted of the design. What a treat to see this design in stitches! It may also be seen on Pinterest. The use of Or Nue Embroidery as a technique to stitch this piece was perhaps also a touch of brilliance. The design outlines could be traced on the fabric, and then the outlines could be used to couch the gold thread, thus eliminating the need for frequent changes of color which would be needed to needle paint the Angel garments. Thanks for sharing and reading along. Enjoy your weekend of stitching!